Isn’t it a wonderful quirk of nature that just as the coldest months are about to begin, the days also begin to lengthen? The winter solstice is this Sunday night. After that, the days start lengthening toward spring. Why not take a little time from the rush and stress of the winter holidays and simply celebrate light? Light in all its beautiful forms. Sunlight, starlight, candlelight, firelight, Christmas tree lights . . . what are your favorites? And light as a symbol. Of hope, happiness, mystery . . . what does light symbolize for you? How often do we take time to reflect on how much light means to us, and how much we take for granted our many artificial light sources? Usually only when there’s a power outage, and then the main reaction is annoyance, when really, it should probably be gratitude. Sunday’s 8 hours, 49 minutes and 36 seconds of sunlight (here in Hudson, Wisconsin, where I live) is the shortest day of the year, and Sunday night, the longest night, at 15 hours, 10 minutes and 52 seconds. Oslo, Norway will have less than 5 hours and 53 minutes of sunlight on Sunday. Is it any wonder that winter solstice celebrations often include a bonfire? This winter solstice falls at 5:02 pm here, a half hour after sunset on Sunday night. Solstice night is also dark of the moon this year, so it will be a dark, dark night. But a clear moonless winter night becomes a glorious celebration of light. Starlight glittering off a snowy landscape is the perfect setting for a magical ski outing. As is more often the case around the winter solstice, the forecast here is for a cloudy night with sleet or snow. Not so great for stargazing, but perfect for curling up with your journal by the fire. If you’re not lucky enough to have a fireplace, why not a cup of tea or a glass of wine by candlelight? 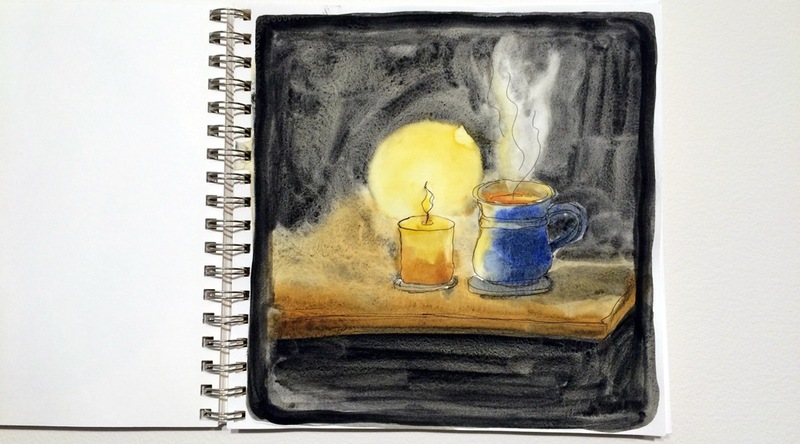 Even a night of “wintry mix” can be welcome if you have a cup of tea by candlelight to look forward to. Or, maybe simply sit in the dark for a bit. How often do you actually have that experience? Even when I turn off all the lights in my house, there is my neighbor’s porch light, passing car headlights, the glow from the interstate exit about 4 miles away, and the lights of Hudson and the Twin Cities metro off to the west. And inside my house, there are all sorts of tiny lights—clocks on the stove and microwave, and little glowing LEDs on various electronics chargers and appliances. Even if it’s cloudy, I like to blow out all the candles and turn off all the lights, even the tiny ones—maybe even take a little drive away from city lights—early on solstice morning. I like to watch the light slowly come into the sky and reflect on the beauty of each unique sunrise. Sunrise is late, but twilight begins much earlier, so I make a thermos of hot tea and take a warm blanket to wrap up in and head out about 45 minute or an hour before sunrise. Sometimes, all I get to see is gradually lightening grey. It seems I’ve spent more solstice mornings than not huddled in my car or in a tent, listening to the soft spattering of sleet. Sometimes, the only indication of sunrise is that I can make out a few more shapes in the gloom, and I still need my headlights to drive home. But, if I’m lucky and the cloud cover doesn’t extend too far to the east, I may get to see spectacular intense reds, pinks or oranges. Maybe even a brief peek of the sun. A cloudy winter morning from some years ago. The brilliant reds and oranges only lasted about a minute before the whole sky was a steely grey again. These effects often change rapidly, and last only a few moments. At home, it’s easy to miss them entirely, especially in winter, when I’m usually at work by the time sunrise rolls around. That makes it seem even more magical when I do get lucky enough to see a few moments of glowing color at sunrise. Especially when there’s been nothing but grey sky for days. You don’t have to be a landscape painter to capture the sky colors in your journal. I might come back to this page and write some of my reflections from the morning, or I may just leave it alone . . . I like it a lot just as it is! And, what if the skies don’t cooperate? Well, that’s one of the reasons I LOVE my journal in winter. When everything outside seems to be some shade of brown or grey, I can still have an explosion of light and color in my journal anytime I want. Grey skies don’t have to get you down! Just for fun (and because I imagine many of you may be spending time with kids over the next week or so), I made some new coloring designs for you. Click the download links to download this “sunburst” design, plus two snowflake designs, print them out and and have fun coloring! If you’d like to go out to watch the solstice sunset on Sunday night and the solstice sunrise on Monday morning, you can get a table of sunrise and sunset times, plus twilight times, for any location worldwide from the U.S. Naval Observatory’s Data Services page.